Collaborative Spray Bottle Painting with Tons of Kids - C.R.A.F.T. 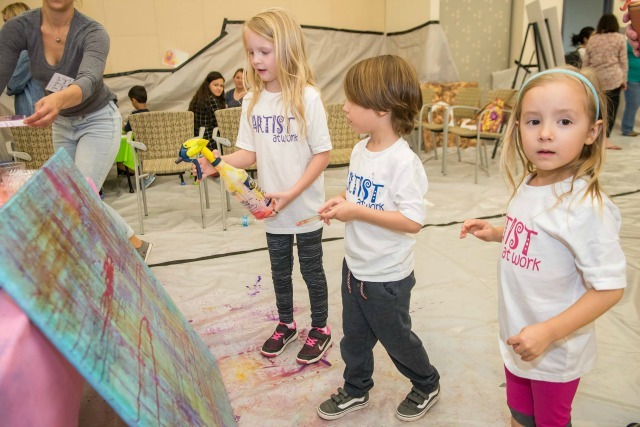 Picture this… A large room covered from floor to ceiling in plastic wrap, 12 artists, and 100’s of kids ready to make art! 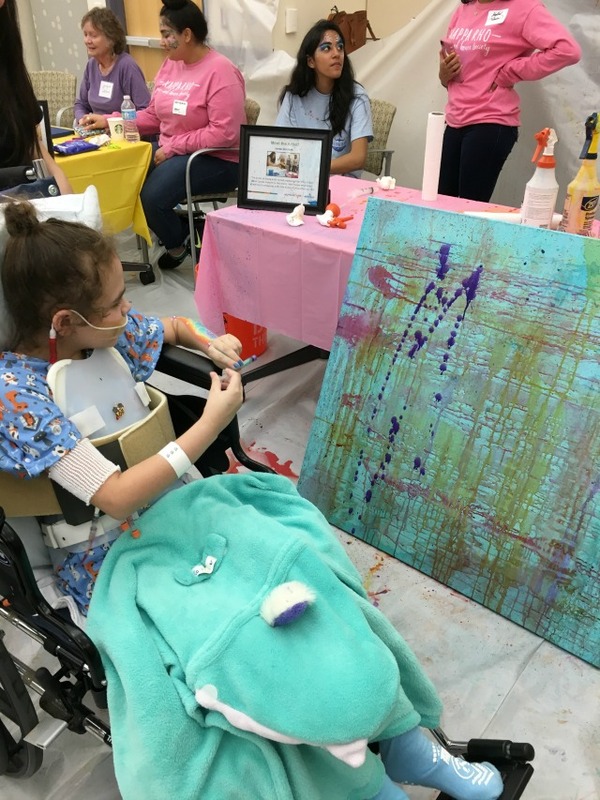 That’s what the annual Art of Giving looks like at Dell Children’s hospital each year. 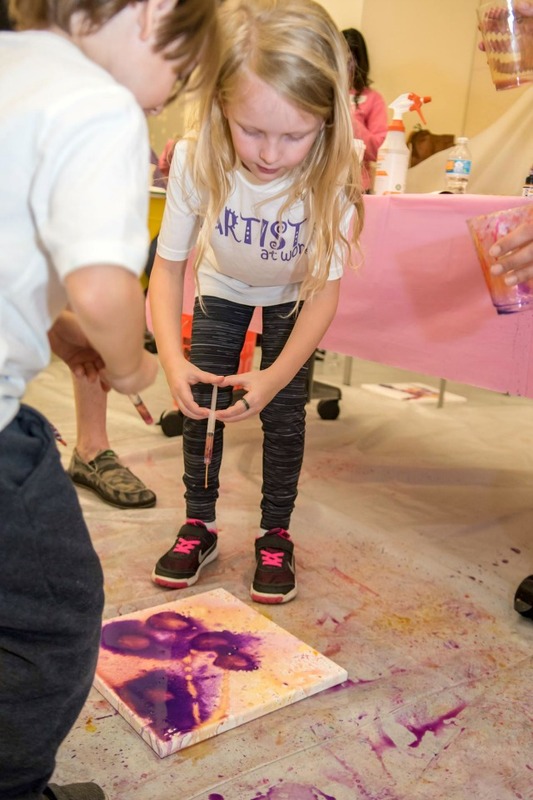 Kids from the hospital and the community come together to make art and then local businesses buy the collaborative art pieces made at the event. 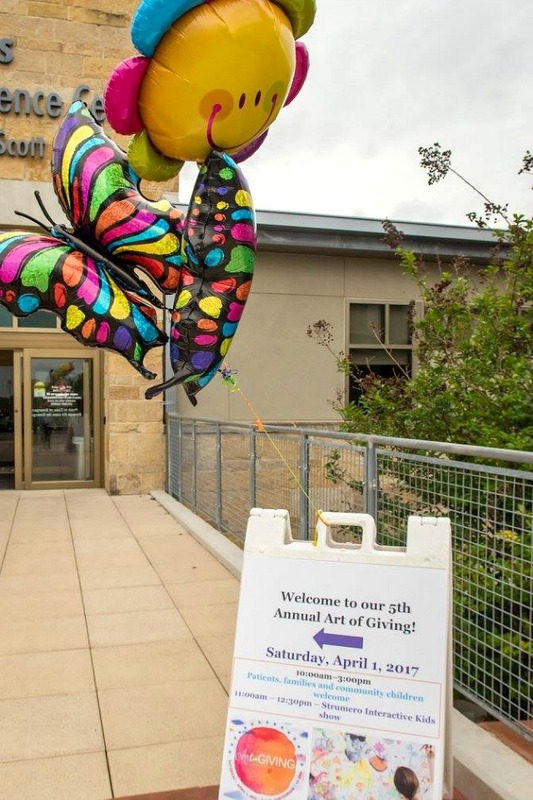 The event raised $120,000 this year to support art, music, and play therapy to kids at Dell Children’s. How awesome is that?! This year’s spray bottle painting might be my favorite peice yet partly because the kids loved making it so much. To be fair, the spray bottle and syringe painting idea was the genius of my mom and friend, Sarah! 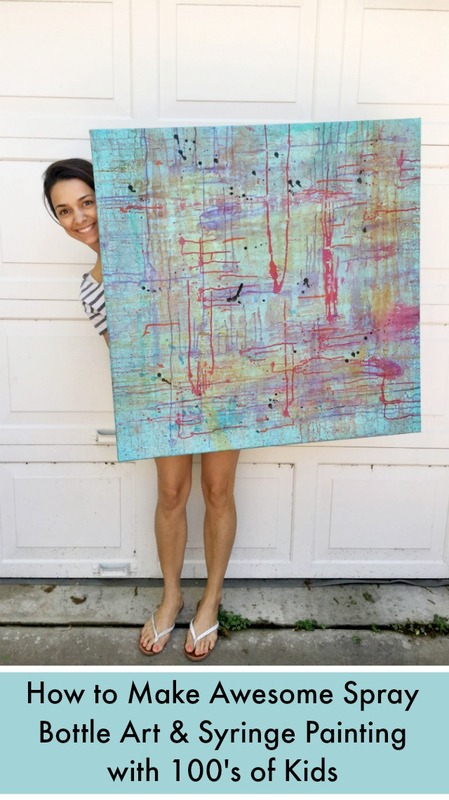 I’m always in a panic before the Art of Giving to come up with a creative art idea that will be fun and look good enough to hang in an office building! Acrylic paint: This is the exact paint that we used, but I did a test run with this washable kid paint out and it worked too. I think any acrylic paint will work as long as you can dilute it with water so that it will go through the spray bottle. An old towel to soak up the paint at the bottom of the canvas: we did not do this, but will do it next time! Spray paint: I used light turquoise by Rust-Oleum to give the canvas a base coat. After the base coat is dry, let the kids go wild! I’m serious. That’s really about it. And the kids will go wild. I actually had 2 boys using the spray bottles end up spraying each other! There are a few other things I learned that will help your painting not turn into a yucky brown blob. 1. Rotate the canvas every 10 or so sprays. I think it turns out best if the drips come down all 4 sides. You can see in the picture below, the paint drips were mostly going down. 2. Don’t have unlimited colors and spray bottles available at all times. I feel like 2 spray bottles and 3 syringes was the perfect amount of crazy. You want to be able to control the color and amount of paint that goes on the canvas. 3. 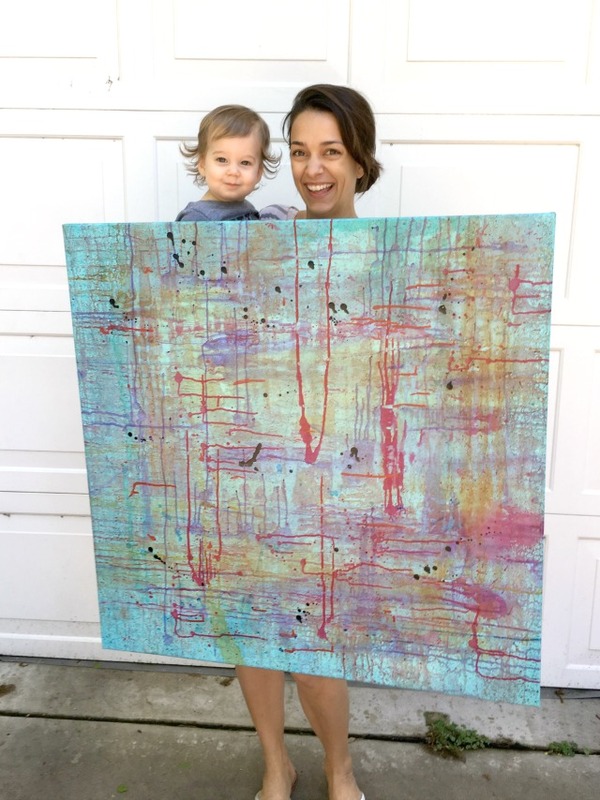 If a kiddo gets super excited and squirts a crazy amount of paint on the canvas, don’t fret! Keep a spray bottle with plain water and use it to “erase” when necessary. You can see the purple below was really bold, so after she was finished I just used the plain water to dilute the paint right on the canvas. 4. If you a really young kiddo who is going wild with the spray bottle, hand them the water only spray bottle! 5. The Art of Giving is a one day event from 10-3, so having helpers was essential! How sweet are these little artists at work?! 6. 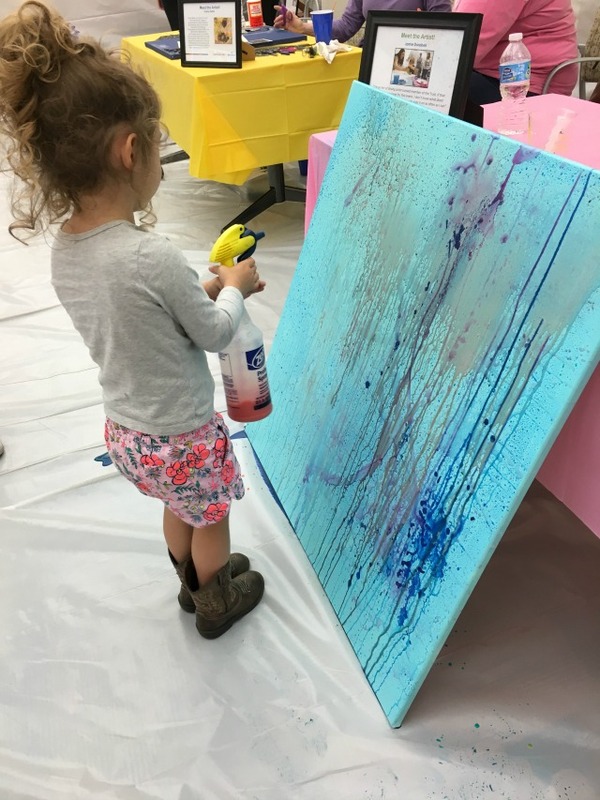 At some point you will want to deem the painting done, so it’s helpful to have a few smaller backup canvases so that kids can continue to create after the big peice is completed. 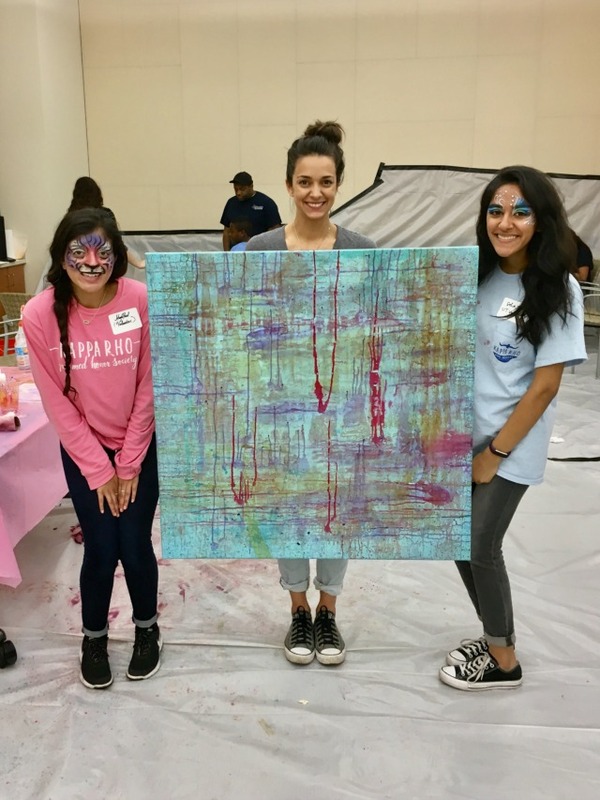 These little artists had a blast making this small canvas with syringes only! 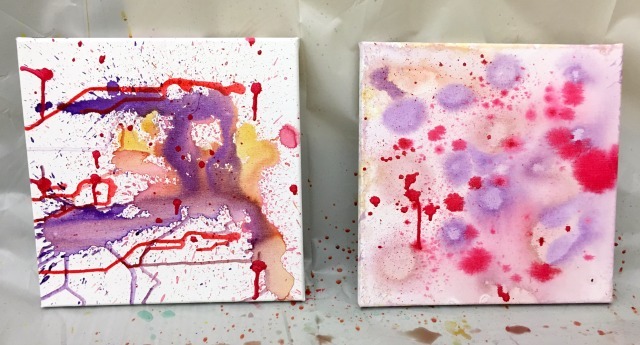 Here are the 2 smaller pieces we made with syringe painting after the big one was completed. These will also be sold to local business to raise money for Dell Children’s! Since these were a last minute add, I did not get to spray paint the background color. 7. The last thing I did to the peice was add a few bold squirts of hot pink paint with the syringe. I also added a few splatter paint drips of black paint to finish the piece. What do you think? I love it! I want to make one together as a family and hang it above our fireplace! And here’s the final peice that was sold for $10,000! Have you ever tried spray bottle painting? Or syringe painting? Or both? I can promise you that the kids will love it and a huge mess will be made! Messy art is always the best art, right?! I love this idea, and the fact that it was for such an amazing event. The pieces turned out beautifully. 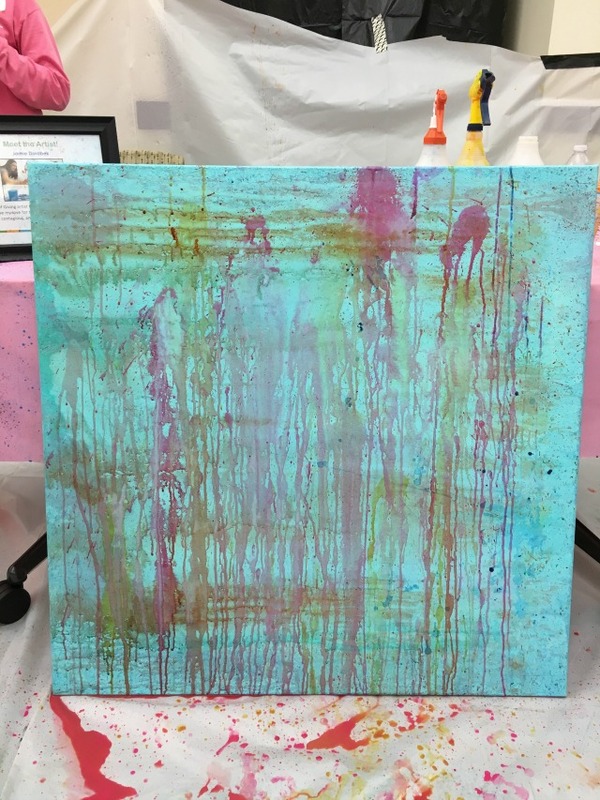 I have done some incredibly messy art ( we painted with butcher paper and water balloons filled with paint ) but this has such a classic and finished feel. I love it. I think we are going to give it a try on our own family night. The Art Of Giving looks like an amazing event. I love watching kids create art, there’s a light in their eyes that’s unforgettable. I have to try this spray bottle painting technique. It looks fun and the results are impressive. Thank, Mary! 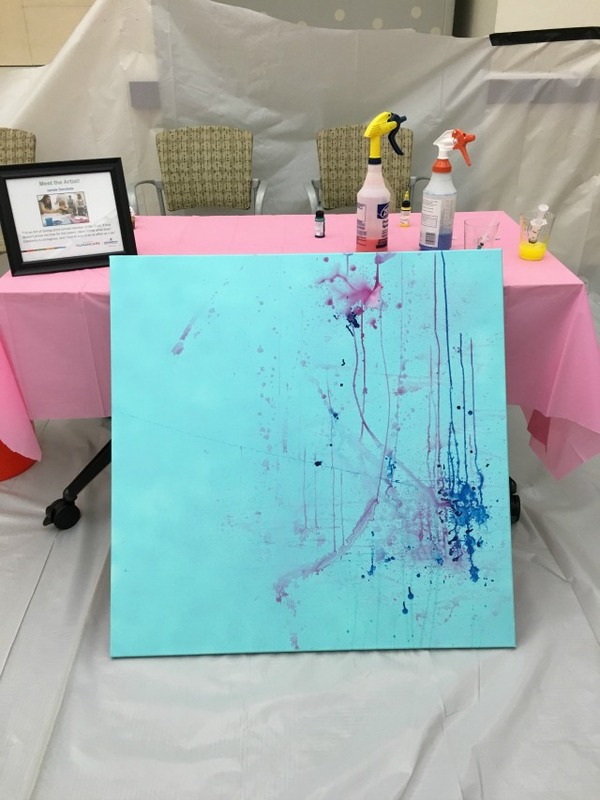 The Art of Giving is such a fun idea for a fundraiser for any event! What a fun day for the kids! The painting turned out amazing and all for such a great cause! I may just have to attempt this painting activity with the kids this summer. The more paint the better! What colors did you use to avoid the “muddy” look? Hi Sarah! I’m not sure which one you are referring to? They are all kind of muddy 😉 My color advice is don’t have brown or black on the table. And you can “fix” anything that looks like it might make a brown blob by using a plain water spray bottle to lighten the color while everything is still wet. Hope that helps!